You Want To Give Your Patients This Surprise. I know we try our best to reduce the number of surprises we give our patients at the best of times. But there is one surprise they will love. The surprise of receiving a compliment. Complimenting your patient will often make your patient’s day just by your one comment. Don’t ever miss the opportunity to make your patient’s day. I recently heard a business call their team, “The Day Makers’. I thought at first this phrase was slightly cheesy and corny, but you know what? It really is the truth! You can and should be your patient’s “Day Maker”. If you are caring for your patients properly then helping them have a great day will always be important to you. If you are already doing a great job at providing your patients with a great day, then keep finding new and creative ways to keep doing this and don’t stop. Being a Day Maker can be what makes your practice different and what sets you apart from just the average dental office. A great idea is to meet regularly with your team and discuss how you can improve and add to your patient’s experience. 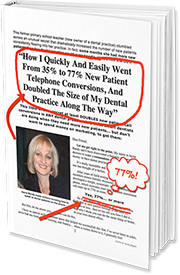 This is what my Dental Practice did, and the sharing of ideas kept us doing it. Our patients loved it and they loved us. We were their “Day Makers”. Sharing ideas with your team and having specific ways you care for your patients means your team knows what to do and how important the patient experience is. This is equally important for the new patient on the very first phone call to the nurturing and caring of your long-term patient who has been coming to see you for over 20 years. Being your patient’s Day Maker is an opportunity to really care for your patient and maybe take them by surprise.